As an answer to a cry in their hearts to help orphans in their community, four biological sisters turned their two story town home into a care facility for medically fragile babies. 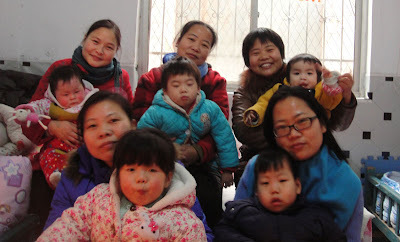 The orphaned children are delivered to the sisters’ special care by eight orphanages within the county and districts of Pingdingshan in Henan province. In 2011, the 4-Sisters care home helped more than 70 orphans with serious diseases, 22 of them had surgeries. The children are returned to their Chinese orphanages once fully recovered, but until that time, the sisters give them four times the love and attention. Contributions to Children’s Hope, which are directed toward the 4-Sisters care home, are used for the home’s rent and the children’s medical bills.